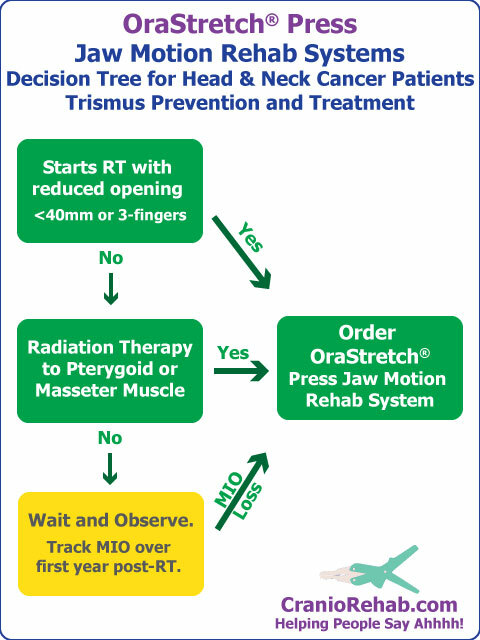 When to order a Jaw Motion Rehab System for Trismus Prevention from Radiation Therapy. When should you recommend using a jaw motion rehab system like the OraStretch press to prevent trismus after radiation therapy? Who is most at risk for developing trismus from radiation treatment? We provide research and a decision tree to help you prevent trismus in head & neck cancer patients. OraStretch®, TheraPacer™, NutriSqueeze™, Salvate™, and CryoJaw™ are a trademark of CranioMandibular Rehab, Inc. All copyrights and trademarks that appear on this site not owned by CranioMandibular Rehab, Inc. are the property of their respective owners. Many of our products require a prescription by a medical professional and should be used only under the guidance of a doctor. All information on this site is provided as a public service for general information, and is not for specific medical advice. Always consult with a medical professional for individual treatment and medical advice, regarding your diagnosis, condition, and treatment. CranioMandibular Rehab, Inc. assumes no liability or responsibility from the use of any product or information provided by our websites or marketing, and we make no claims or warranties regarding content, services, materials and/or products. Please see our site's Terms and Conditions for more information. Copyright CranioRehab.com. All Rights Reserved. eCommerce Software by 3dcart.